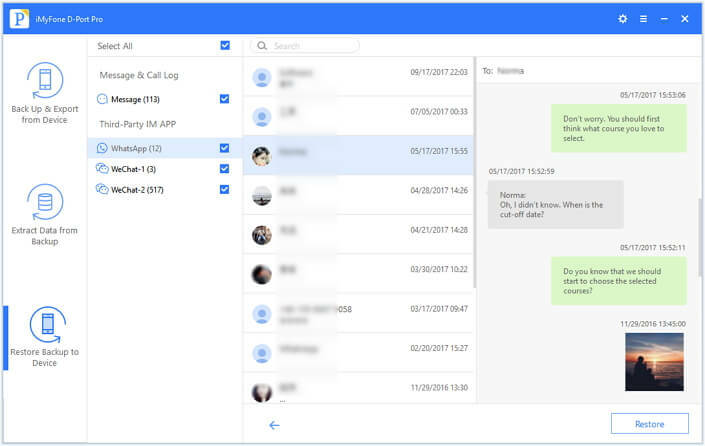 Messaging platforms are extremely popular throughout the world, and that's because they allow people to socialize conveniently, no matter where they are on the planet. Kik is one of those that people seem to love – it allows users to send messages and audios, share pictures, videos and more with friends. However, there's an aspect which users don't love at all – the inability to restore messages. 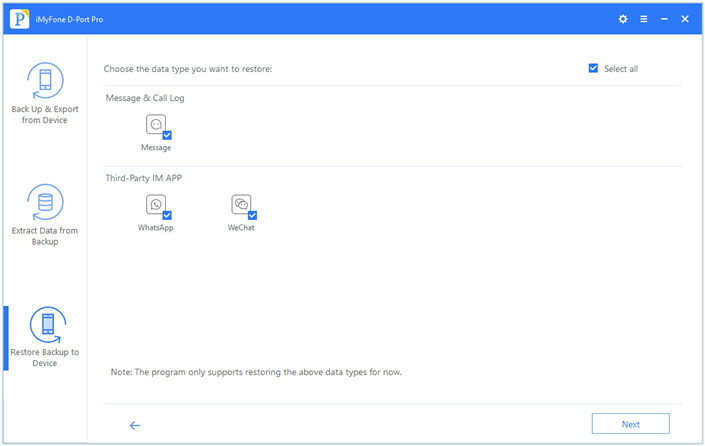 Unlike WhatsApp or WeChat, Kik doesn't support to back up and restore users' data it its built-in settings. This brings about an awful lot of inconvenience, and it's something that the platform is unfortunately lacking. Although, what about the users that just want to restore their Kik messages? If that's the case, then you can turn to a specialist backup and restore tool to perform that task for you. 2. How to Restore Only Kik Messages on iPhone from an iTunes backup? 3. 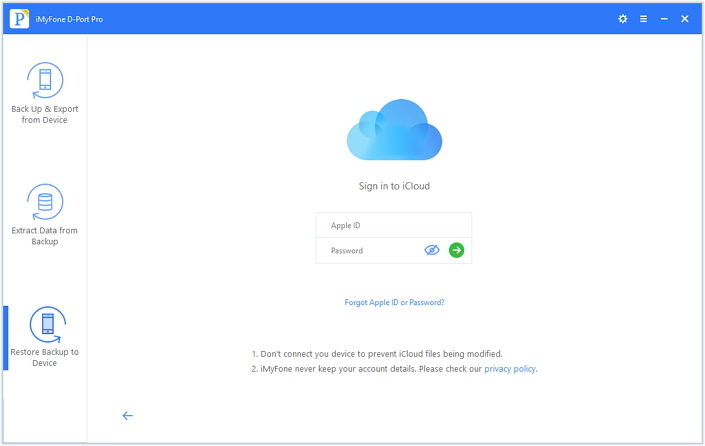 How to Restore Only Kik Messages on iPhone from an iCloud Backup? 4. How to Back Up iPhone without Overwriting Previous Backups? You can back up and restore certain type of data on your iOS device without affecting other types of data. It is totally risk-free. You can restore the type of data you need from your backups, including iTunes backup or iCloud backup. There is no need to restore the whole backup - this is what iTunes or iCloud cannot do and you don't have a ton of other data that you don't want. It can back up your iPhone without overriding any previous iTunes or iCloud backups. It supports every type of Apple devices and iOS versions, including the latest iPhone X and iPhone 8 running iOS 11. What may surprise you is that the backup function of this iOS backup and restore tool is totally free! It's worth noting that the tool doesn't currently support Kik, but, a new update will be coming VERY SOON which will incorporate Kik! 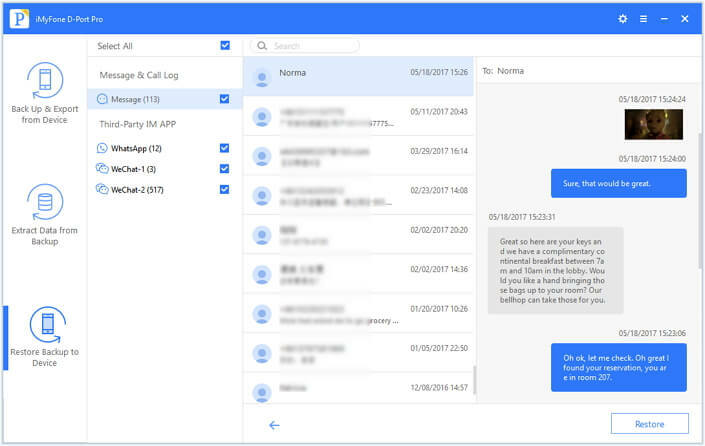 We will discuss how to use the software to restore Kik messages from an iTunes backup to your iPhone and how to back up your iPhone without overwriting old backups for free. Follow its easy guide. 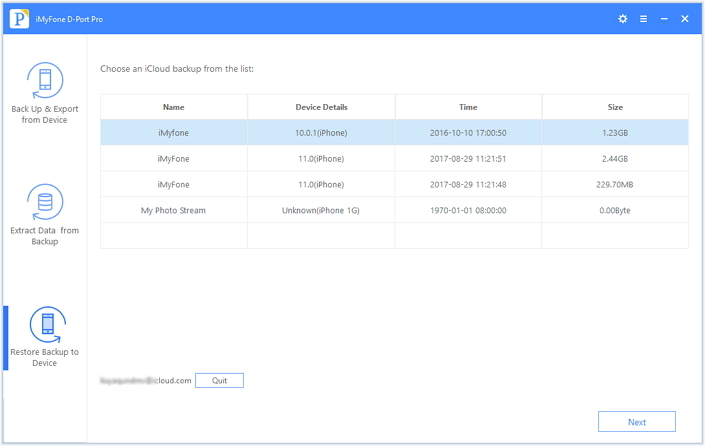 After downloading and installing the program, you can just go to iMyFone D-Port Pro, and choose 'Restore Backup to Device'. The program will load all the backups on your computer, including all the iTunes backups, or the backups you made by the program. Step 1: Here you need choose an iTunes backup which includes the Kik messages you need and then click 'Next'. 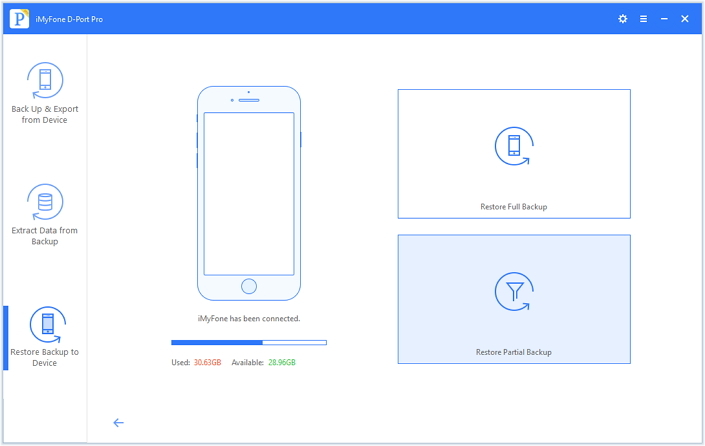 Step 2, D-Port Pro will display two options: "Restore Full Backup" which will restore the whole backup to you device and "Restore Partial Backup" which will allow you to restore the data you need only. Select 'Restore Partial Backup' and the program will show you several matters need attention. Step 3. Click 'Next' to choose the data type you need to restore. For now the program supports only the types displayed on the window but it will support more. Step 4: Click 'Next', and it will scan the iTunes backup and display all of the data types that you selected after scanning. You can preview the data to confirm whether you really need to restore it. Step 5: Once you're happy, select 'Restore', and it will then show you after everything is restored to your iPhone. 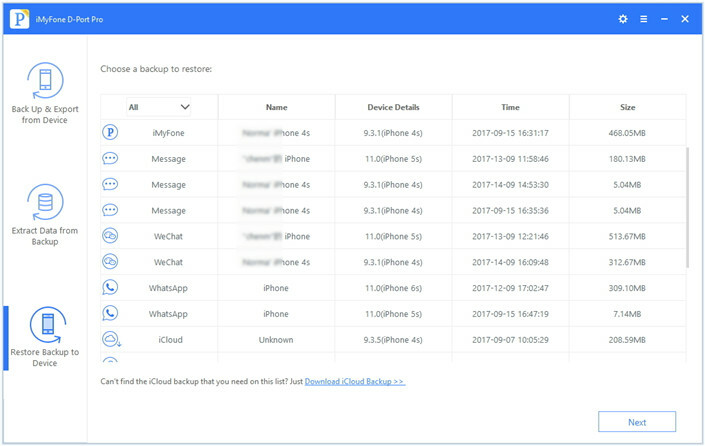 Step 1: from the window which displays all your backups, click 'Download iCloud Backup >>' which is under the backup list to log into your iCloud account. Don't you worry about the security of your privacy – iMyFone won't keep your account information. Step 2: Choose the iCloud backup which includes the Kik messages that you want to restore and then click 'Next' to choose the data type. Step 3: Then click 'Next' and the software will download the backup. After downloading, the rest steps are same with the above method: you just need to preview and the program will work like magic restore the Kik messages to your iPhone. 4. Back Up iPhone without Overwriting Previous Backups? This can be pretty easy for iMyFone D-Port Pro and it will do this for you for free. You can refer to how to make a full backup for iPhone/iPad/iPod touch. So, yes, Kik doesn't offer you the in-app ability to restore your valuable messages, but by using the above methods, there are ways around it! Give iMyFone D-Port Pro a shot and try it now!